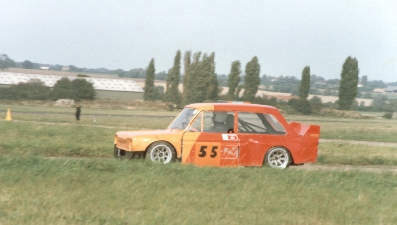 An old photo' of the Rawlson spaceframe Imp which was driven in 2000 by Simon Benoy and Gerry Richards. The car carried Impspeed sponsorship, and much of the sheet metal and body work was carried out in Impspeed's workshops. Simon and Gerry are going to do the HSA/Aldon Automotive Speed Championship again this year: "We had good fun last year in our G15 and 930 Imp respectively, bashing Elans, Minis TVRs etc., so we thought we'd get something even faster!" All prices are exclusive of VAT. Tbe weights quoted can vary as all parts are hand made. The above prices are effective from 1 November 1982 and are exclusive of VAT and carriage. Alan Ramsay (Linwood Area) brought a Davrian-Rawlson race Imp to the National at Huntingdon, Imp 2014.